The former pop star and current fashion mogul sparked some serious concern from her Instagram followers when she posted a pregnancy photo to the social media platform. Rather than upload a picture of her baby bump, as some might reasonably expect, Simpson instead revealed a close-up of her left foot … and it didn't look good. In the photo, Simpson's foot and ankle appears very swollen. In the caption, the 38-year-old asked fans for advice on how to reduce swelling, writing, "Any remedies?! Help!!!!" Understandably, Simpson's fans responded to the celeb's Instagram post with worry. As reported by The Stir, one person commented, "JESSICA ARE YOU OKAY WE NEED TO KNOW." Another social media user wrote, "Remedies? Girl, go see your doctor. That looks bad. Be careful." Others theorized that Simpson's swollen foot might be a sign of the dangerous pregnancy condition called preeclampsia. "Please see your midwife or physician immediately. You are retaining fluid and have a hallmark sign suggesting preeclampsia," a commenter noted. Someone else commented, "Go to the doctor! Preeclampsia; I was put in the hospital for it." According to Mayo Clinic, preeclampsia is marked by "high blood pressure and signs of damage to another organ system, most often the liver and kidneys," and it often begins when an expectant mother is about 20 weeks along in her pregnancy. Symptoms may include bad headaches, nausea and/or vomiting, vision changes, and shortness of breath, among others. Swelling can also occur, especially in one's hands and face. Without treatment, preeclampsia could lead to serious complications for both the expectant mother and her unborn child, including "fetal growth restriction," premature birth, and cardiovascular disease. While the "most effective treatment" for preeclampsia is giving birth, doctors may prescribe certain medications to the expectant mother, order bed rest, or suggest hospitalization in order to best care for the mother and baby. A number of celebrities have battled preeclampsia during their pregnancies, including Kim Kardashian, Beyoncé, and Mariah Carey. Kardashian famously turned to surrogacy after experiencing complications while carrying daughter North and son Saint. She welcomed daughter Chicago via surrogate in January 2018. Kardashian and husband Kanye West are reportedly now expecting their fourth child via surrogate, who, according to Us Weekly, is likely a baby boy and could arrive "in very early May." Simpson's swelling, however, may not be due to preeclampsia. As Dr. Yvonne Butler Tobah said in an answer on Mayo Clinic, several different things could cause swelling during pregnancy. "For starters, your body retains more fluid during pregnancy. Also, your growing uterus puts pressure on your veins, which impairs return of blood to your heart. Hormonal changes also play a role," Tobah stated. Staying off one's feet, wearing compression tights, and donning loose clothing can all reportedly help foot and ankle swelling. Simpson previously announced that she was pregnant with her third child — a daughter— in September 2018. Sharing a photo of what appeared to be a gender reveal, she told her Instagram followers, "This little baby girl will make us a family of five. We couldn't be happier to announce this precious blessing of life." Regarding Simpson's pregnancy, a source told Us Weekly that Simpson and her husband, former NFL player Eric Johnson, were "surprised but overjoyed" upon learning that they'd be having a third child. "Jessica and Eric are over the moon," the insider revealed. "They are so happy and very excited." According to Romper, Simpson's baby may arrive as early as March. However, Simpson hasn't revealed her due date to the public, so this is all just speculation. Simpson and Johnson already have two children together, 6-year-old daughter Maxwell Drew and 5-year-old son Ace Knute. Speaking with Us Weekly about parenthood in May 2018, Simpson shared, "Being a mother is the best opportunity and challenge I've ever been blessed with in life." She continued, "Right now my kids are in this amazing stage where I'm really listening to them without judgment and they're teaching me so much," adding, "These little innocent kids teach me so much about life." In December 2018, Simpson showed off her growing baby bump by posing alongside her husband for a Christmas-themed photo, with her wearing a Rudolph the Red Nosed Reindeer onesie. We can't wait to meet Simpson and Johnson's newest addition to their famous family — we just hope that Simpson continues meeting with her doctors in order to best care for herself and her unborn child. 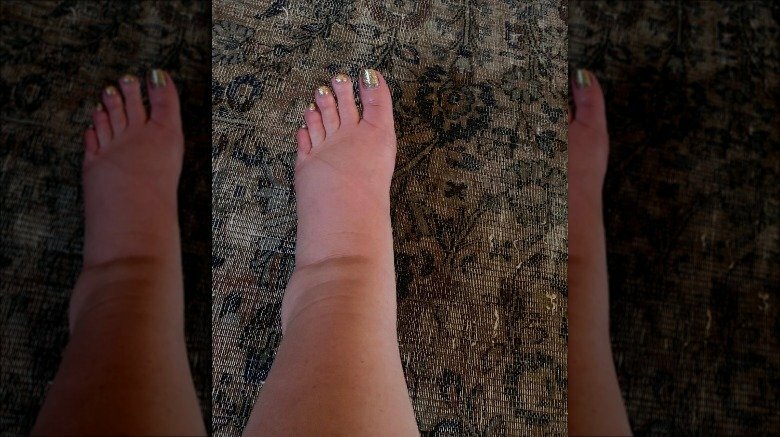 Talk to your doctor about those swollen feet, Jess!